Take your first step toward a successful career in medical coding with guidance from the most trusted name in coding education! 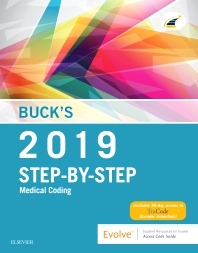 The bestselling Buck’s Step-by-Step Medical Coding is a practical, easy-to-use resource that shows you exactly how to code using all current coding sets. Explanations of coding concepts are followed by practice exercises to reinforce understanding of the material. In addition to coverage of reimbursement, ICD-10-CM, CPT, HCPCS, and inpatient coding, an Evolve website includes 30-day access to TruCode® Encoder Essentials. No other text so thoroughly covers all coding sets in one source!